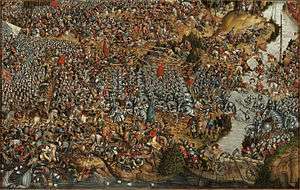 The Muscovite–Lithuanian Wars (also known as Russo-Lithuanian Wars, or just either Muscovite Wars or Lithuanian Wars)[nb 1] were a series of wars between the Grand Duchy of Lithuania, allied with the Kingdom of Poland, and the Grand Duchy of Moscow. After several defeats at the hands of Ivan III and Vasily III, the Lithuanians were increasingly reliant on Polish aid, which eventually became an important factor in the creation of the Polish–Lithuanian Commonwealth. Before the first series of wars in the 15th century, the Grand Duchy of Lithuania had already gained control of a lot of Rus' territories, from Kiev to Mozhaisk, following the collapse of Kievan Rus' after the Mongol invasions. Over the course of the series of wars, particularly in the 16th century, the Muscovites were able to expand their domain westwards, taking control of many Rus' lands. Muscovy and Lithuania had been involved in a series of conflicts since the reign of Gediminas, who defeated a coalition of Ruthenian princes in the Battle on the Irpen' River and seized Kiev, the former capital of Kievan Rus'. 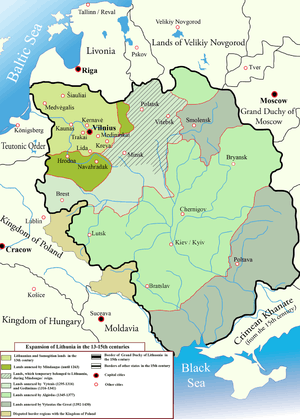 By the mid-14th century, an expanding Lithuania had absorbed Chernigov and Severia. Algirdas, the successor of Gediminas, forged an alliance with the Grand Duchy of Tver and undertook three expeditions against Moscow, attempting to take advantage of the youth of the Grand Prince of Moscow, Dmitry Ivanovich, who nevertheless succeeded in fending off these encroachments. Some elements in Muscovy wished to gain control of all territories that once were part of Kievan Rus', many of which were at that time part of the Grand Duchy of Lithuania (including today's territories of Belarus and Ukraine). Further, Moscow wished to expand its access to the Baltic Sea, an increasingly important trade route. Thus, the conflict between Lithuania and Muscovy was only just beginning. Around 1486–87, territories along the ill-defined Lithuanian–Muscovite border in the upper reaches of the Oka River were under attack by Muscovy, allied with Meñli I Giray, khan of the Crimean Khanate. Tensions continued to rise. In August 1492, without declaring war, Ivan III began large military actions: he captured and burned Mtsensk, Lyubutsk, Serpeysk, and Meshchovsk; raided Mosalsk; and attacked territory of the Dukes of Vyazma. Orthodox nobles began switching sides to Moscow as it promised better protection from military raids and an end to religious discrimination by Catholic Lithuanians. Ivan III officially declared war in 1493, but the conflict soon ended. Grand Duke of Lithuania Alexander Jagiellon sent a delegation to Moscow to negotiate a peace treaty. An "eternal" peace treaty was concluded on February 5, 1494. The agreement marked the first Lithuanian territorial losses to Moscow: the Principality of Vyazma and a sizable region in the upper reaches of the Oka River. The lost area was estimated to be approximately 87,000 km2 (34,000 sq mi). A day before the official confirmation of the treaty, Alexander Jagiellon was betrothed to Helena, daughter of Ivan III (the role of the groom was performed by Stanislovas Kęsgaila as Alexander was in Poland). In the meantime the war continued, just not as successfully for Muscovy. 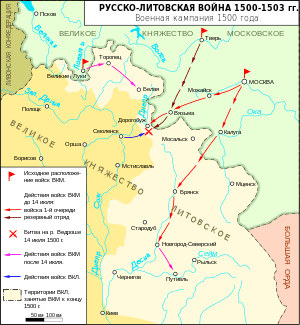 As Lithuanian forces arrived to the region, the Muscovite forces had to move slowly. Additionally, the Livonian Order, led by Wolter von Plettenberg, joined the war as an ally of Lithuania. 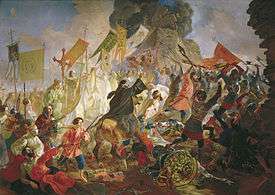 The Livonian troops won the Battle of the Siritsa River in August 1501, besieged Pskov, and won the Battle of Lake Smolino in September 1502. In 1502, Ivan III organized a campaign to capture Smolensk, but the city withstood the siege as Muscovites chose poor strategy and did not have enough artillery. Peace negotiations began in mid-1502. Alexander asked Vladislaus II of Bohemia and Hungary to act as the mediator, and a six-year truce was concluded on the Feast of the Annunciation (March 25) in 1503. The Grand Duchy of Lithuania lost approximately 210,000 square kilometres (81,000 sq mi), or a third of its territory: Chernihiv, Novhorod-Siverskyi, Starodub, and lands around the upper Oka River. Russian historian Matvei Kuzmich Liubavskii counted Lithuanian losses at 70 volosts, 22 towns, and 13 villages. The Lithuanians also acknowledged Ivan's title, sovereign of all Rus'. Despite the peace treaty, the relationship between two countries remained tense. Sigismund I demanded extradition of Michael Glinski for trial, while Vasili III demanded better treatment of his widowed sister Helena. Vasili also discovered that Sigismund was paying Khan Meñli I Giray to attack the Grand Duchy of Moscow. At the same time, Albert of Prussia became the Grand Master of the Teutonic Knights and was unwilling to acknowledge Poland's suzerainty as required by the Second Peace of Thorn (1466). The tension eventually resulted in the Polish–Teutonic War (1519–21) and allied Maximilian I, Holy Roman Emperor with Vasili III. 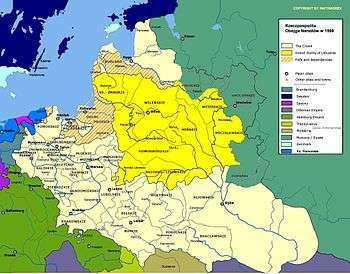 In December 1512, Muscovy invaded the Grand Duchy of Lithuania seeking to capture Smolensk, a major trading center. Their first six- and four-week sieges in 1513 failed, but the city fell in July 1514. Prince Vasily Nemoy Shuysky was left as viceregent in Smolensk. This angered Glinski, who threatened to rejoin Sigismund I but was imprisoned by the Russians. In 1536, the fortress Sebezh defeated Nemirovich's Lithuanian forces when they tried to besiege it, and then the Muscovites attacked Liubech, razed Vitebsk, and built fortresses at Velizh and Zavoloche. Lithuania and Russia negotiated a five-year truce, without prisoner exchange, in which Homel stayed under the king's control, while Muscovy kept Sebezh and Zavoloche. In 1547, The Grand Duchy of Moscow officially became known as the Tsardom of Russia, with Ivan IV being crowned as Tsar and "Ruler of all Rus'". Gathering the ethnically Russian lands of the former Kievan Rus' becomes an official policy of the Russian state. The next war may be seen as part of the Northern Seven Years' War or the larger Livonian War, as it involved most of the powers around the Baltic Sea. During the reign of Sigismund II Augustus in Poland and Lithuania, Tsar Ivan IV invaded Livonia; first in 1568 when the Livonian Knights sought alliance with Poland and Lithuania: the Poles and Lithuanians were able to defend only southern Livonia. At first, Lithuania and Poland were allied with Denmark and fought against the Tsardom of Russia allied with Sweden; after several years the coalitions changed and Poland–Lithuania allied themselves with Sweden against Russia and Denmark. Eventually, the 1570 ceasefire divided Livonia between the participants, with Lithuania controlling Riga and Russians expanding access to the Baltic Sea by taking hold of Narva. ↑ The conflicts are referred to as 'Muscovite wars' (Polish: wojny moskiewskie) in Polish historiography and as 'Lithuanian wars' in Russian one; English historiography uses both, ex. 'Muscovite wars' in Lukowski, Jerzy; Hubert Zawadzki (2001). A Concise History of Poland. Cambridge University Press. p. 63. ISBN 0-521-55917-0. and 'Lithuanian wars' in Wilson, Andrew (2002). The Ukrainians: Unexpected Nation. Yale University Press. p. 53. ISBN 0-300-09309-8. . Some sources also may use Russo- instead of Muscovite. ↑ Lietuvos istorijos institutas (2009-10-02). "1501 10 03 Lenkijos taryba ir Lietuvos atstovai nutarė, kad abi valstybės bus sujungtos į vieną valstybę. Lietuva šios sutarties neratifikavo". Lietuvos Didžiosios Kunigaikštystės kalendorius (in Lithuanian). Delfi.lt. Norkus, Zenonas (2009). "Kada senoji Lietuvos valstybė tapo imperija ir nustojo ja būti? Atsakymas į lietuvišką klausimą, naudojantis estišku metodu" (PDF). Lietuvos istorijos studijos. 23. ISSN 1392-0448. Soloviev, Sergei M. (1976). Graham, Hugh F., ed. History of Russia. The Age of Vasily III. 9. Gulf Breeze: Academic International Press. ISBN 0875690661.